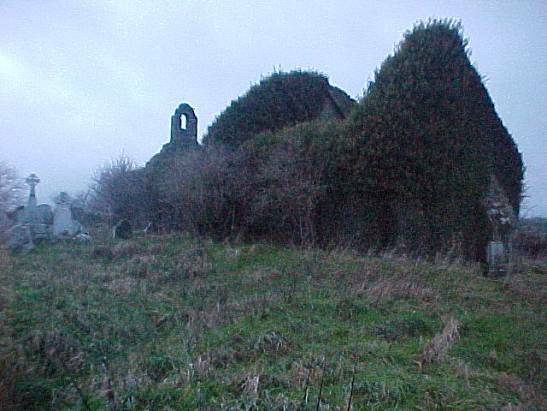 The ruins of Barony Church are in the townland of Ballyconra, on the land of John Kennedy. The church stands in a large field known, not suprisingly, as the “church field”. 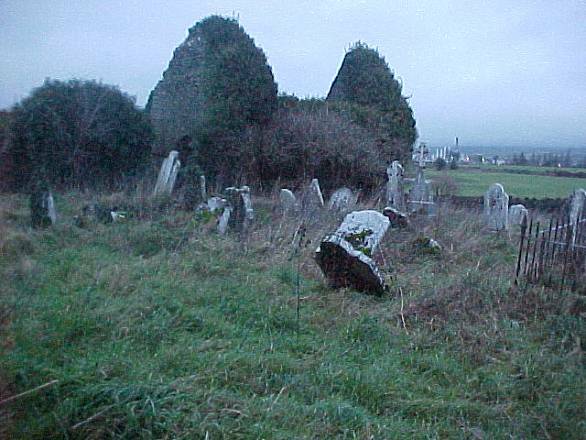 A wall, over three feet thick, formerly enclosed the church and gravely – an area of about three-quarters of an Irish acre. This wall has long since collapsed, though its outline can be clearly traced. The present church yard, surrounded by a relatively modern wall, occupies no more than one third of the original area. The original name of the church was Acheteyr (or Aghteyr). It is mentioned in official documents dating back to the thirteenth century and mentioned in the Red Book of Ossory. St. Brigid’s among other saints, is mentioned as being venerated here. Shortly after the Norman Invasion, the parish of Aghteyr was granted to the Piory of Inistioge and remained a possession of that house until the Reformation. After the Reformation Aharney became the parish church of Aghteyr and gradually the parish itself came to be known as Aharney. A report of 1615 stated that “there was no minister there”. The nave of the church, appoximately 60 feet by 30 feet, is the oldest part of the church and dates back to at least the early twelfth century. An original window in the north wall, framed with grit stone, has survived the ravages of time remarkably well. Recent renovation work has unearthed the “spud” of the doorway in the north wall, establishing the inner floor level. Following the advice of Mr Louis Feeley, the debris inside the building was removed to the level showing that there had been an accumulation of up to two feet in places. The cut-stone belfry atop the west gable is now visible for the first time in years with the removal of dense ivy. Carrigan described a doorway in the south wall which had been reduced to a “mere breach” but it would now seem that is was never any more than that – a mere breach. Access to the chancel, which is probably more modern, is through a cut-stone arch which is in perfect condition. This chancel was roofed and the arch sealed off with stonework and a doorway to convert it into a mortuary chapel for the Mountgarret family. The internal walls are plastered and the window modified, thus destroying the original features of this part of the building. A flag floor was laid, many of these flags bearing inscriptions commenorating the Mountgarret family. 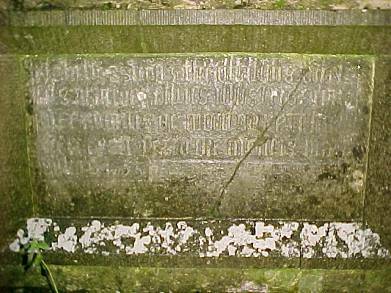 The oldest monument in the chancel is a plaque erected on the wall over an altar tomb which marks the burial place of Theobald Butler (son of Edmund, Second Viscount Mountgarret and Grissal Fitzpatrick, daughter of the First Baron of Upper Ossory) who died in May 1635, and his wife Lettice Fitzgerald, who was a niece of the Earl of Kildare. The nave of the church later became a popular burial place and among the many monuments here is one to Richard Marum Esq. of Aharney who was the father of Mr. E.P. Mulhallen Marum M.P. There are many traditions surrounding the Church’s history. A road was said to have linked the church with Seskin and Durrow (via the Ballagh) to the north, and with Grange Church and Rathbeagh to the south. A further road linked up with the Lisdowney-Ballyragget road at Kennys. Indeed traces of such roads can still be observed in the Church Field. Barony Church. Locals believe that the church was re-roofed for use as a Catholic Chapel about the time of the Williamite Wars and that the last Mass to be said here was for soldiers departing for these wars. It is known that Colonel Edward Butler, who had acquired the Mountgarret castle and estates at Ballyragget ten years earlier, raised a regiment of dragoons in 1689 and led them in the Jacobite army. Could these have been the departing soliers for whom the final Mass at Barony was celebrated? Tradition further holds that the sacred vessels of the church were buried adjacent to one of the roads leading from the church (no metal detectors here please). During the “troubles” the church was, apparently, the scene of some “unofficial” burials and courts martial.